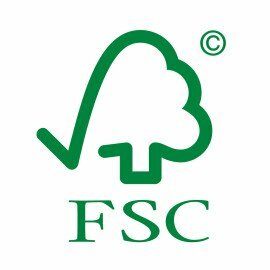 FSC refers to the Forest Stewardship Council, whose mission is to promote the ecological management of forests, which has a socially beneficial effect and which is economically viable. Their efforts are part of the greater movement towards sustainable development. A forest that is managed conforming to FSC regulations is a forest that has a long term positive impact at the social, ecological and economic level. Forests that are not managed from a sustainable development perspective, but rather for short term profits, will rapidly disappear, leaving behind an empty space that cannot be used for hundreds of years, if ever. Responsible and sustainable development of a forest has a positive consequence for surrounding communities and for society in general. They improve living conditions and maintain the forest for future generations. How to recognize FSC wood? A certification process exists for wood coming from forests used in the framework of sustainable development. To obtain FSC certification, a producer must meet specific criteria. These criteria are centred around the use of the forest, but also on the treatment of surrounding communities and how the company using the forest is managed. All these aspects are part of a framework of sustainable and responsible development. If a producer meets these criteria set by the FSC, they can receive certification. Additionally, beyond certification for the activities in the forest, there are also certifications for companies producing products using certified wood, certification for the traceability chain. This sustainable development certification is not only for the wood used in construction, but also to other products using wood. You can find this logo on certain paper packages, for example. In fact, you can see it on all products made from paper or wood. Looking for this logo is a great way of supporting sustainable development around the world. There also exists a verification called controlled wood, which deals with forests that do not meet all the criteria of the Forest Stewardship Council, but respect certain conditions. Everyone benefits from sustainable development. It aims at ensuring that resources that are available today do not disappear. This means that future generations can benefit from them, just like we do today. In the case of forests, sustainable development means avoiding deforestation and the erosion that it causes. Sustainable development applies not only to the forest but also the consequences of its use. Our purchases help support responsible forestry companies. Associating long term economic value to a forest means that it won’t be cut (or even deliberately burned) in order to turn it into pasture, for example. The decision to do business with certified suppliers rather than non-certified ones is a simple and concrete act with an important impact with regards to the sustainable development vision of our company. The hundreds of tons of wood that we buy each year come from forest that will continue to absorb atmospheric carbon, produce oxygen and supply useful and renewable material for future generations – to which we can add the preservation of biodiversity and the ecology of forests. Finally, if no one purchases wood products that are not certified FSC, there will no longer be economic benefits for illegal or irresponsible forestry companies. Without purchasers, they will simply disappear. Sustainable development is not only the responsibility of governments and large companies. As an individual, you can do your part by choosing certified wood for the construction of your patio or your fence. « Wood patio return on investment – how much value does a wood patio add to your home?